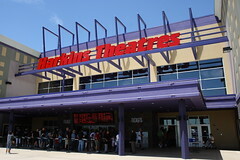 I read on the Harkins Theatres web site that they would be holding a ribbon-cutting ceremony to mark the grand opening of the Christown 14 theatres at 11:15 this morning. I got there just a couple of minutes late, but they had done the ceremony at around 10 because people had been lining up around the building and waiting since 6. I had an interesting experience as I ran up to the theatre from my car with my camera: a young woman walked by and quickly asked, “Newspaper?” I said, “No,” and she said, “Just for your own enjoyment, then,” and walked to her car. She was wearing a backpack, and it made me wonder whether she were a journalist, and why she wanted to know. I just wanted to get a photo, and didn’t want to take the time to explain that I was a blogger of sorts, and although I wasn’t exactly “Newspaper,” I wasn’t just doing this for my own enjoyment, either. I saw this as an opportunity to take my new lens and battery grip out for a shoot and gain some “event photography” experience in the meantime. Anyway, I get excited about urban renewal, cinema, theater, and architecture, so I enjoyed getting there and taking this photo even if I didn’t catch a ribbon-cutting and had to run off to work right after snapping a couple of shots. Strange but true: J.J. loves to lick master’s wet legs after a shower. Oh!! So *THAT* is what the building was! I passed by that location when I was picked up from a friend’s home back in June. I was trying to see where the light rail station is and couldn’t see it, and assumed maybe that was the new building. Thanks for blogging about this! I was there at 7:15 am. People in front of me had been there overnight. We got into a verbal confrontation with the guy in front of us because he parked a chair there at 7am and didn’t return until almost 11am. He finally left. Seems like the majority of the crowd are people who go to midnight movies in costume and will be at the midnight book sell of Harry Potter (yes, me too). Thanks for visiting and commenting, Yvonne! Nice to hear from someone who was there early.